There are many areas of your home that you may be searching to find the perfect bar stool. The dining room, kitchen, game room, or basement bar may be where you plan on putting bar stools. Bar stools are a great way to add seating to a room without taking up a ton of space. Regardless of where you need them, we have the perfect bar stools for your space. Selecting the perfect bar stool is a process. Different rooms will probably require different types of chairs or stools. The kitchen counter vs the basement bar space for example. You may want high back bar stools for the basement bar and backless stools for a kitchen coffee bar counter. 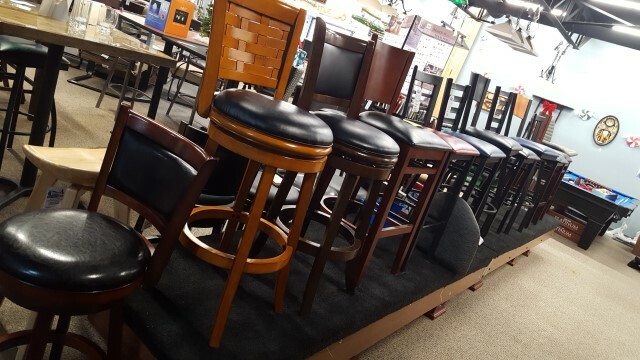 There is a large variety of bar stools in our Waterford and Macomb showrooms, allowing you to find just the type you are looking for. Our inventory of bar stools includes a selection of styles from the best brands. With a selection of woods or finishes for you to choose from, you will be sure to find exactly what you are looking for. High back bar stools or backless bar stools are both included in our showroom selection. The style bar stool you choose is completely up to you, but we are here to help. Be sure to ask about our exclusive sales on bar stools! We offer many specials on the items you need to design your space, including bar stools. In addition to bar stools, you can find other great accessories for your game room or dining space. Ask a showroom host about pool tables, pub tables, or game tables that may complete your entire look. When it comes to designing a space for family or friends to gather, we have what you need.